Everyone has a secret…and some secrets are worth killing for. Tobias Mead is rich, handsome, and charming—a popular combination with the ladies in New York City’s high end clubs. But the night he meets Penélope, everyone else ceases to exist. Their attraction is immediate and intense. When Penélope’s body is discovered in a nearby park, Tobias is devastated—and then terrified. The police accuse him of murder, and his face is plastered on every news outlet in the city. If that’s not bad enough, it turns out that Penélope was romantically involved with Antonio Cabrera, the volatile heir of a dangerous Central American drug cartel. Now the family wants revenge, as well as something valuable that Penélope may have left with an unsuspecting Tobias. Everyone shoots to kill, and Tobias is caught in the crossfire as New York City explodes into terrifying violence. The only person he can trust is Annabel, a woman as lethal as she is beautiful. But with this many enemies, even her impressive firepower may not be enough. As the bodies pile up, Tobias has just one card left up his sleeve. Although he’s sworn he would never use it, he might not have a choice. “We’re here now,” the thick-set Hispanic cab driver said, “230 Fifth Avenue.” He brought the car to a halt a few inches in front of a long line of people. Tobias Mead casually got out of the taxi and straightened his gray suit. He gazed at his reflection in the window and tidied his short-cropped blond hair. He walked toward the line and glanced at the crush of women desperate to get into the club. Although some of them remained in the main line, some stood to the side, possibly refused entry due to a lack of ID and other undisclosed reasons. As Tobias continued to make his way to the front, he noticed the somewhat angry looks directed at him from some of the men, whom he suspected had been waiting for hours with no indication as to whether they would get in. Teddy smiled and patted his friend on the shoulder. Tobias then made his way to the rooftop, past a host of waitresses and promo girls, who gave him alluring glances and kisses on the cheek. He responded to the women’s affection by gently caressing their shoulders and waists. Tobias was greeted by extremely loud music upon reaching the club’s main dance floor. He walked past a large bar on his right as he made his way toward the outer section. He glanced at the oval tables positioned about four feet away from each other, each sitting about six people—mainly girls—with one or two men flashing their credit cards. Moving through the dance floor, he wondered why the club even bothered having it. Adding more tables would have been a better idea, such was the demand for them. He sighed as he stepped out to the roofless section, the full view of the moonlight greeting him. He caught a glimpse of the table reserved for him. He counted at least six women sitting around it, pouting and hardly speaking to each other. He straightened the collar of his black shirt, ran his hands across his suit and walked forward. He looked closer at the cabana and noticed two of his regular party girls, Amber Harris and Tiffany Johansson, at the center of the table. After briefly introducing himself to the new additions to his party crowd, he sat and read the drinks menu. The club steadily approached full capacity, and women gradually filled the dance floor as a host of men looked on, some with folded arms. Tobias, oblivious of the numerous glances coming his way, spoke into the ear of Chris Hawkins—one of the club’s main promoters—as a steady stream of alcohol arrived at the table. With a round unshaven face, Chris was charming and friendly to all who knew him. “Man, you know how to party, Tobias,” Chris said. He sipped some of his Champagne. “Well, I ain’t getting married any time soon, so why—“ Tobias swallowed, unable to say another word. He noticed a striking young woman in the midst of the throng on the dance floor. She walked outside to the courtyard, seemingly unimpressed with the vast amount of alcohol sitting on the tables. Her white dress fit tightly against her flawless body—size four, probably. The mystery lady walked past a number of tables, occasionally stopping to gaze into the sky, maybe at the stars. With what seemed like judgmental eyes, she rested her gaze on Tobias, a look that almost hinted at disappointment. © 2012 All rights reserved. 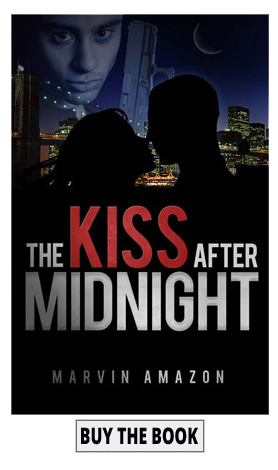 Excerpted from The Kiss After Midnight by Marvin Amazon, Corinthians Publishing. Used with permission. I received a copy of The Kiss After Midnight in exchange for my honest review. 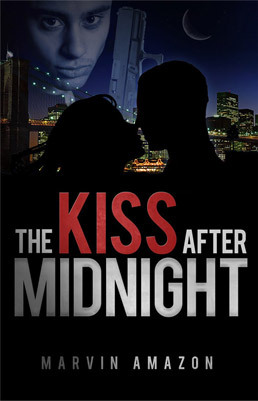 That review can be found in its entirety at: http://krystalwrites.hubpages.com/hub/Review-The-Kiss-after-Midnight-The-Midnight-Trilogy-Book-1. Thank you so much for this opportunity. It was a pleasure reading The Kiss After Midnight, and I hope when you release books in the future, you will consider me to review them.